We have been delighted with the positive response and support the Baby Cambridge Fundraiser has received thus far. It's terrific to see so many of you supporting the invaluable work carried out by East Anglia's Children's Hospices. 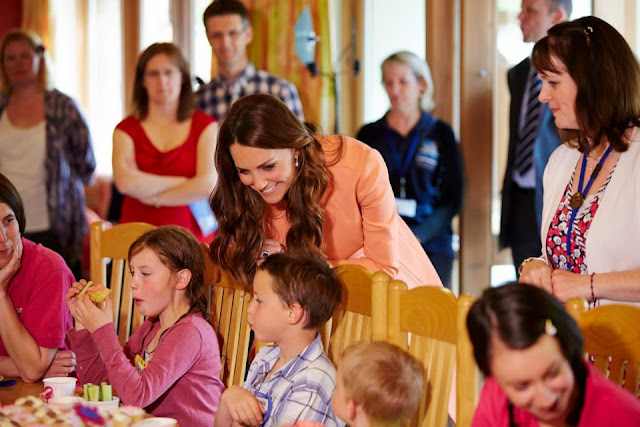 The Duchess described the organisation as "inspirational" and in her role as patron of the charity she spent part of her second anniversary visiting Naomi House to mark Children's Hospice Week. We will be running a host of contests, giveaways and online activities in the coming months featuring items from a selection of Kate's favourite brands. We want to make this fundraiser fun whilst raising much needed funds for EACH. For our second giveaway (I hope you all enjoyed the Links of London giveaway over at What Kate Wore last week) we have two amazing prizes I think you will rather enjoy, especially with summer approaching. Have you guessed what they are yet? Yes, it's beachwear from one of Kate's favourite brands, Vix. The First Prize includes the Cayman Bia Tube Bikini. The blue and white tie dye halter neck style bikini features logo sliders for adjustable coverage and removable padding. It retails for £198. The Pipa Kaftan retails for £199. 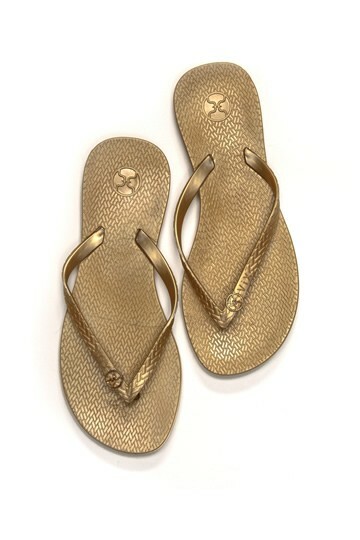 And the final item included in the first prize is a pair of Gold Vix Sandals. The second prize is the Cayman Bikini and a pair of gold flip flops. Before we share information on how to win these fabulous prizes, Claudine Davies, owner of Chelsea-based Biondi Couture, stockists of the widest selection of designer swimwear, beachwear and accessories in the UK, not to mention a favourite of Kate and Pippa's, has kindly shared some essential tips to help you perfect your holiday wardrobe. Top London beachwear boutique Biondi Couture is where you’ll find all your holiday essentials and is a firm favourite with Kate and Pippa, and many other celebrities. Buying a bikini is not always an easy task, so Claudine has shared her top tips. What is the philosophy behind the store? Biondi stocks an amazing selection of designer swimwear, beachwear and accessories in the UK, providing everything for the perfect holiday wardrobe. I am committed to ensuring my clients look and feel great in their swimwear, and travel around the world to find new and exciting products. I always say wearing a swimsuit is the most naked a woman ever is in public, so it makes sense to invest in looking good. It is Biondi’s aim to source styles that compliment and inspire confidence as well as look fantastic. What are your top tips for swimwear shopping? Choose a shop like Biondi with knowledgeable and helpful staff. Don’t be scared to ask for advice and try on as many shapes as possible. Always select fit over fashion. You will not look good if the suit does not fit properly. Don’t be afraid to invest in a well-made bikini as they will often fit you better. Resist covering up your worst bits in fabric – this will accentuate them and make them look bigger. For those who really struggle with their shape, choose a shop that sells separates or choose a bespoke bikini as this is made to measure to fit your body exactly. So we’ve found a bikini that fits well, but how else can we boost our beach confidence? Most importantly make sure you’ve found a swimsuit or bikini that you feel happy in and then get a fake tan, wax or shave and make sure you have a nice manicure and pedicure. If you feel confident you will look great! What are the bestsellers for Summer 2013 at Biondi? We’ve got a gorgeous range of Vix as favoured by Kate – see the Vix giveaway for a taster! Yes, the Vix Bia tube bikini in any colour or print is a must-have. This classic Vix bikini is cut to perfection – making it popular with lots of celebrities. Kelly Brook, Coleen Rooney, Denise Richards, Kim Kardashian and Abbey Clancy have all been seen wearing it! With many thanks to Claudine for sharing her incredibly helpful tips. One can take a look at the magnificent selection of swimwear at Biondi here and find out more about their bespoke service here (A very exciting new website will be launched on May 20th). 1) For one entry, leave a comment, telling us where you would love to wear your Vix Swimwear this summer? Dream destination? 2) For a second, entry like the Baby Cambridge Fundraiser on Facebook or on Twitter and log that activity. 3) For a third entry, Share information, links or a graphic about the Fundraiser on Facebook, Twitter or Pinterest and log that activity. 4) For a fourth entry, like Biondi Couture on Facebook or Follow Biondi Couture on Twitter and log that activity. Would love to wear that swimsuit on my annual beach trip! So cute! Would love to wear one of those stunning bikinis in Sunny South Africa or on a Mozambique beach - paradise!! Waikiki is the place for me! Would love to wear one of these on the beaches of Goa, India during my summer trip there! I would love to wear this Vix bikini in a Greek Island!!! I would love to win the swimsuit and wear it on my summer vacation to Florida. I would love to wear this on a cruise with my hubby to somewhere warm- maybe even on the Royal Princess! I'm going to Tahiti this summer and would love to wear this bikini! I'm going to the Maldives! Would love to wear a Vix bikini there! I'm off the maldives! would love to wear my vix bikini there!! I'll wear that bikini on my honeymoon in Belize! I've been hitting the gym and working on a healthier body image to prepare for my wedding (and life! ), especially after my fiance's young niece asked me if I was going to have a baby soon because my tummy is HUGE. I was mortified. Talk about motivation though! I haven't worn a bikini in years and am determined to prance out onto that beach as the fit, confident woman I used to be! WOOT WOOT! I would wear the bikini in Belize, specially in the island of Ambergris Caye, a lovely lovely island full of happy people that I can't get enough of! What a wonderful prize in support of EACH! I'd love to wear it on one of our beautiful beaches here in North Carolina! I must say my dream vacation would definitely be in Seychelles!!! It looks and sounds breathtaking and a very special and quiet place to vacation. My two year wedding anniversary is coming up in June and we would love to celebrate with a cruise to Mexico or a trip to Vancouver Canada. I am following the Baby Cambridge Funderaiser on Facebook and Twitter. And I am also following Biondi on Facebook and Twitter too. I have shared this giveaway on Facebook and Twitter. I would have to say a dream vacation would definitely be Seychelles!!! Wow, it looks and sounds breathtaking and a very special and quiet place to vacation. My two year wedding anniversary is coming up in June and we would love to celebrate with a cruise to Mexico or a trip to Vancouver Canada. I am following the Biondi Couture and Baby Cambridge Funderaiser on Facebook and Twitter. I have shared this giveaway on Facebook and Twitter. I'd love to wear the bikini on West Palm Beach this summer! I would wear my bikini on Mustique Island. Would love winning these! These will be awesome this summer having fun with friends! I would definitely wear the bikini to some of the beautiful beaches around Victoria, BC this summer! However, my dream would be to wear it in Hawaii...I am planning a trip for myself there next year as a graduation present! I would love to wear that bikini sunning myself at a poolside in Las Vegas! Additionally, I've liked Baby Cambridge Fundraiser and shared a graphic on Facebook, and I've liked Biondi Couture as well. Thanks for an amazing giveaway! I would love to wear the bikini when I'm sunning myself by the poolside in Las Vegas! Also, I've liked Baby Cambridge Fundraiser and shared a graphic on Facebook, and I've like Biondi Couture as well. Thanks for a great giveaway! I'm going to Hawaii, so I'd love to wear the swimwear there!!! My dream beach destination with either be the Maldives or Bali. I've heard they are amazing and I hope one day to visit them both! I'd love to wear the Vix bikini when I visit Greece this summer! I'd love to wear the Vix Bikini while on vacation at the Shore this summer! It's a beautiful piece for a great summer in the sun! I would love to wear the Vix suit while at the shore this summer! It's the perfect bathing suit for fun in the sun! I follow BCF & Biondi Couture on twitter (@DMVRunnerGirl). Also posted a link on twitter to #BCF fundraiser. I would wear the bikini in the OC, CA- gotta look hot! Not sure if my original post went through but that gives me 4 entries :) Thanks for the awesome giveaways! A few blocks away from my street there is a quarry that has filled in with rain water over the years. In the summer, the water is always warm, and always Caribbean blue even though we're so far away from the south. I'd love to wear the Vix bikini there. Also, two years ago I had to move away from my best friend. This summer, I'm flying out to go see her for a week, and she lives 30 minutes away from the beach, so I'd also love to wear it there. My dream destination would be Hawaii, because the last time I went there it was the most beautiful vacation I've ever had, and I'd love to have that experience again. I would wear the Pipa Kaftan and Gold Flip Flops to my local pool this summer. Sooo cute! Can you see us in this ladies, ha ha I love the white shift (cover up) that I would love. I need some of that sunshine, we have had rain and wind today. But it is good for the fires in Ventura. Sarah- We used to call them "go a heads"...lol My grandson call's them flip flops and he is only 4...lol Hope you win something. Me in a bikini would be a sight to behold---especially one size 8. Glad you and Pauline are safe from the fires. Yay!!! I would love to wear the cover up to the beach in Kauai, Hawaii with my Hub and new baby girl!! Telling my cousin in Denver Colorado about Prince Harry being in Colorado. She didn't have a clue so I told her about the Veterans game he will be going to in Colorado Springs. She said it just so happens her brother will be in Colorado Springs that weekend. So she thought she would maybe try to take her son and get me a picture. Ha this is all good fun but, a worthy cause for our American and British Veteran's. Love that Mistique comment! Haha, me too! Greece is also my dream destination, especially since I just watched Sisterhood of the Traveling Pants. And I am addicted to your blog. Seriously. I would love to wear this bikini on a white sandy beach with a bright turquoise ocean - to match the beautiful pattern. Maybe Bali or somewhere as luxurious as the bikini! Though it would look equally stunning on the less sunny beaches of Wales! I would love to wear the Vix swim wear on a vacation in the Virgin Islands. I'd wear it to Hawaii! I'd wear to a destination wedding in Hawaii in November! Charlotte, HELP!!! I have tried several times to give to BCF, but obviously I am doing some thing wrong. I created an account and can login. Once I click the pay with credit or debit card, it won't let me past that page. I know I am probably doing something wrong, but ????? Anyone else have problems trying to donate? Any help or advice welcome! I would love to give to this great charity! Kate I'm so sorry to hear you are having issues. Leave it with me for a couple of hours and I'll find out what's going on and leave a comment directly under this one. Hi Kate from Texas- When I donated I did not create an account. You can try it that way and see if it work's better for you. Kate - Trisha set up a Virgin Money page which should work perfectly. So sorry about the inconvenience. Charlotte, as I said in my post, I was honored to give! EACH is a wonderful charity! Quick question.... Some have given a gift aid in addition to their donation. What is a gift aide? Kate have a blast, a jolly good time, Do wish I could get a postcard but, all of us have the joy of being somewhat Anonymous :) Maybe you can hook up with a few Duchess Kate fans or better yet Charlotte. Kate - Gift aid is a policy which enables tax-effective giving by people in the UK so you'll notice quite a few people from the UK use it. I am hoping to finally go on vacation this year, so I would love to a have a new bikini to wear!!! I am hoping to finally go on vacation this year. A new (and amazing!) bikini to wear would be great!! I would love to wear this bikini in spain! would be great!! Of course I would wear it in Mustique! I have donated and I encourage all of you to DONATE...this is such a worthy cause! Shared on Twitter, commented here, shared a banner on Facebook, follower of Biondi Couture and like Biondi Couture on Facebook, already a follower of @RoyalFundraiser and like baby Cambridge Fundraiser on Facebook... I should have done it right! I would love to wear this outfit to Mustique on my DREAM vacation! It would be the perfect ensemble! What a fun giveaway! I have had many issues with my ISP this past week, so I missed the first giveaway and was pretty bummed. I have also missed posting on this great blog the past few days! :) Well, I will be vacationing in London this year, so no bikini needed. I think my bikini days were 4 kids ago....LOL!!! Good luck to all of those entering to win! Charlotte, I just donated to BCF and was honored to do so! Thank you for allowing us the privilege to give to such a worthy cause! I hope there's a great response and the goal is reached. Many congrats and love to the Duke and Duchess of Cambridge. Baby Cambridge and these precious families EACH provides services to are loved. Charlotte, thanks for all you do with this blog. I wish you, your fellow bloggers, and EACH the VERY best of luck in reaching your goal!!!! Dream Vacation to wear the Vix bikini, kaftan, and flip flops would probably be to Fiji or Indonesia. Such a relaxing destination for such comfortable, chic looking clothes/bikini. Followed @BiondiCouture on Twitter. @brittburgess is my twitter handle. I would love to wear it celebrating my 2 year's remission from Hodgkin's Lymphoma -- in my own backyard! My husband just had a beautiful hot tub installed as a gift to me ;) and it would be a nice treat for him! Cassie- Congrats on your remission. My god continue to bless you & your family. Cassie, your post made me smile!!! Congrats on your remission!!! Best of luck in the giveaway!!! I would totally wear this on vacation...we are thinking about a cruise?!? Soooooo exciting. However, I would be so excited to win...probably would wear it around the house everyday!!!! Haha! Am I weird for crafinf for an other kate sighting? I have also liked the fundraiser page on both Facebook & Twitter! And I have followed Biondi Couture on Twitter! I would love to wear the suit in Mustique, just like Kate! But since that's not likely, I'll settle for Vegas where I'll be later this month! I have liked the fundraiser page on Facebook and followed on Twitter. I have also followed Biondi Couture on Twitter! Thanks for the news that Jamie Lowther-Pinkerton is leaving. I didn't know that! Quite amazed he is going, he does indeed seem to have been their right-hand man. I had imagined that he had loved the job. I would LOVE to wear this suit in Fiji, on my honeymoon this year! Hey Kate from Texas.- I too are having Duchess withdrawals. But knowing she is with William in Anglesey make's it ok. They need to be together at this very special time in thier lives. Just think in about 9 weeks we will hear that baby Cambridge was born. I am hoping for a baby girl. Hope all is well with you in Texas. Kate, Texas USA - I was just going to comment on the same thing. Charlotte, do you have any idea what Kate has been up to during this dry spell. I have been checking to see if there are any upcoming engagements for her in May. Kate, Texas, USA - I am having a Kate withdrawal too. Charlotte, do you know if Kate has any engagements planned for May? Do you know what Kate has been up to on her dry spell? Just curious, as I miss seeing her when she is out and about. Thanks. Ok this is the right blog post!!! I would love to wear this bikini on our annual family beach vacation sooo cute!!!! I'm hoping to visit Europe for the first time this summer and this would be the perfect ensemble to pack in my suitcase! 1) I'd love to wear my Vix swimwear to the Cape! 2) I've liked the fundraiser on Facebook. 3) I've shared the post on Facebook. 4) I've liked Biondi Couture on Facebook. I'm hoping to wear this on my trip to Disney World with my family this summer, celebrating my graduation from law school! I would love to go to Fiji. I would wear this lovely bikini to the British Virgin Islands for my family's annual sailing trip. Dreaming of faraway places, but the local beach will be sufficient. Love the kaftan! I'd just love to wear this outfit in Spain on the beach this summer. It's sophisticated and fun and the colours go with anything! :-) it would be a dreamy look that would be in loads of my holiday photos for sure! I'd love to wear Vix while on the beach in Savannah, GA for my cousin's very special wedding weekend. I'd just love to wear this to the beach but my dream destination would be the Greek Islands. I've liked the Baby Cambridge Fundraiser on Facebook. I've liked Biondi Couture on Facebook. I'd love to wear this just to the beach but my dream destination would be the Greek Islands. I think I left my comment as anonymous before by mistake. I don't get a fancy beach vacation this year. This would add a little luxury to my trip to the lake with my son. I'm dying for that kaftan -- I've actually been looking for a white kaftan to wear later this summer to the Florida Keys. I'm dying for that kaftan -- I've been searching for a white kaftan to wear to my vacation later this summer to the Florida Keys. And I'm now following Baby Cambridge fundraiser on Twitter! And also following Biondi Couture as well! I'd love rocking this bikini and sandals in the USVI! I would love to wear the bikini in cape cod and Nantucket this summer! I would like to wear the bikini in Budva, Montenegro this summer! This summer I am traveling to Israel for the first time. I would love to wear the bathing suit there! I would love to wear the bikini in Greece! I've always wanted to visit! I would love to wear the bikini just about anywhere! We're headed to a beach wedding weekend that would be perfect! This beachwear would be perfect for me to wear while relaxing poolside at a fancy Las Vegas hotel this summer. This beachwear would be perfect to wear while lounging poolside at a fancy Las Vegas hotel this summer. Would LOVE to wear this on my trip to Monte Carlo, Monaco!!! A fabulous swimsuit, on my fabulous trip abroad this summer would be perfect. First trip to Monaco!! My dream destination is Bali and I'm lucky enough to be heading there this summer for my brother's wedding! I would wear the bikini in a sunrise beach yoga photo shoot on Ayana resort's private beach - picture perfect! And, of course, it would make many appearances while lounging poolside through our stay there.